We are known for our thorough Expertise, for more than Two decades! Dear Parents and Students, overcome Admission related challenges and gain clarity about choosing the right course and college at our summits. Single window solution for all questions pertaining to pan India Admission Information and Guidance for Students. My Choice My Future is a "Know Yourself Tool" for career choice to help students to understand their personality and choose a relevant career based on their personality. KAB Model Exams (State Level Mock Tests) are conducted across Telangana & Andhra Pradesh in an environment / a pattern that is similar to the actual examination. Visit our rankerslearning.com portal to access 850+ hours of Video Lectures, Question Banks, Interactive sessions, Assessments and Keys/Solutions for all Subjects! KAB-CAREER GUIDANCE EVENTS are highly focused networking platforms for institutions, parents/students to interact face to face with promising prospects. iONPrepTest is an outcome-based Concept Improvement Program driven by a series of benchmarked,improvement exams that are integrated with world class analytics. More than 200000 students have been positively impacted by our Services till date..
Engineering, Medical, Dental, Agriculture, Pharmacy, Management, Hotel Management, Animation College, LAW, Fashion Technology, MBA, MCA, PGDM etc..
National – CBSE - Central Board of Secondary Education. ICSE- Indian Certificate of Secondary Education State Board- Approximately 30 State Boards. KAB Education Fair is a good platform for students seeking information about colleges and courses. The advisory at the Fair helps students to make right and intelligent choices. East or West India is the Best. Arm yourself with good education that will take you places. KAB Educational Consultants has brought together a lot of world class educational institutions at one place for its annual KAB &amp; TV9 Education Summit. It is now the duty of the students to find out what courses interest them and what to study. Many academicians are here to clear your doubts. Whatever course you study, give your 101% to it. If at crossroads, Students must take the assistance of counselors to obtain clarity. With many technological colleges in the State, industrialists here have a lot of opportunity to mentor students and train them as per their requirement. In this endeavor, KAB Educational Consultants helps the students through its annual Educational Fairs. It invites industrialists, corporates and senior academicians to address the students and their parents. In this session, students and their parents can clear their misconceptions and opportunities about the industry and the course. Better informed Students and Parents make better choices. The probability given by KAB is very useful to students for analysing the chances of getting seat in the preferred colleges. 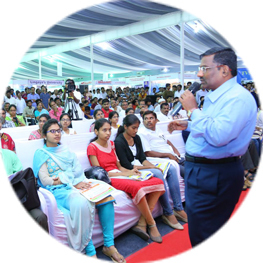 KAB Education Fair is a programme where students benefit and I am happy to be associated with KAB in this regard. ACE Engineering College, Ghatkesar. Hyderabad Dist. Dr BV Raju Institute of Technology, Narsapur, Medak Dist. Anurag College of Engineering, Ananthagiri (vi), Nalgonda Distirict, Kodad. Arjun College of Technology and Sciences, Hayathnagar, Ranga Reddy Dist. Bhoj Reddy Engineering College For Women, Saidabad, Hyderabad Dist. CVR College of Engineering, Vastu Nagar, Mangalapally (V), Ibrahimpatnam(M), Rangareddy District. Anurag Group of Institutions, Venkatapur(v), Ghatkesar (m), Ranga Reddy Dist. Geethanjali College of Engineering and Technology, Cheeryal (V), Keesara (M), Medchal District, Hyderabad. J B Institute of Engineering and Technology, Bhaskar Nagar, Moinabad Mandal, Hyderabad. Vardhaman College of Engineering, Shamshabad, Hyderabad. Sri Indu College of Engineering & Technology, Ibrahimpatnam,Ranga Reddy Dist. Holy Mary Institute of Technology and Science, Keesara, Ranga Reddy Dist. Sagar Global Business School, Kondapur, Hyderabad. Sreyas Institute Of Engineering & Technology, Bandlaguda, Nagole, Hyderabad. Dhruva College of Management, Behind HUDA Oxygen Park, N H 7 Medchal, Hyderabad. CMR Group of Institutions, Kandlakoya (Vi), Madchal Road, Hyderabad. St. Peters Engineering College, Dhulapally (P), Medchal( M), Medchal Ranga Reddy Dist. Nalla Narasimha Reddy Group Of Institutions, Ghatkesar, Chowdariguda, Ranga Reddy District. NRI Institute of Technology, Kothur (R R Dist). Ashoka Institute of Engineering and Technology, Malkapur(v), Nalgonda. MLR Institute of Technology, Dundigal, Hyderabad. Siddhartha Institute of Technology and Sciences, Korremula Road, Narapally, Ghatkesar(m), Ranga Reddy (dt). KAB Educational Consultants, has started the guidance process for Admissions into various Professional Colleges / Deemed Universities / Private Universities across India. The Admission alerts will be sent to registered candidates E-Mail-ID and Mobile, Interested students can register with us for the following courses.